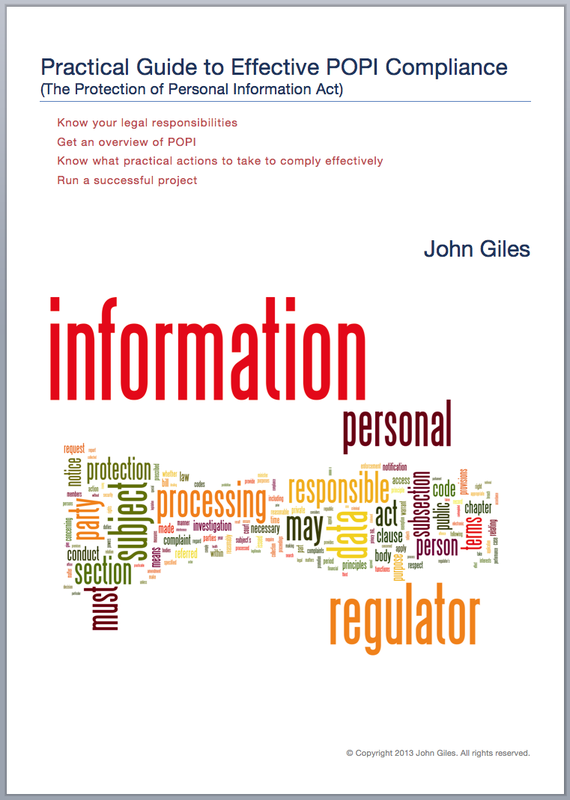 A practical POPI Act guide or book on complying with the Protection of Personal Information Act (POPI) effectively. It sets out what you should do for POPI compliance. This is not an academic text – it contains useful insights in plain language. This guide will help you to take practical effective action to protect personal information at the lowest cost. And get business value out of those efforts. It is packed with visual aids, diagrams, and tools. What does the POPI Act Guide cover? Anyone wanting to know how to comply with POPI. Information officers – to balance access to information and protection of information. To stay out of jail. This guide is not yet available but is in the process of being developed. You can let us know you are interested by completing the form on the right or emailing us now. We will contact you with more details as soon as the guide is available. This is a bespoke product where we consult with you, tailor a guide for your purposes, and customise it with your branding. You can distribute it in print or electronic form to your customers, prospects, or employees on your website, in your promotional material, or in person. Attend one of our POPI workshops. Read how we can assist you with privacy and data protection. Join the Michalsons POPI Compliance Programme. This guide is for all organisations who process personal information, especially those in the Financial Services, Healthcare and Marketing sectors. This is a website-based, interactive, subscription service. It includes a table of contents, an index, end notes, further reading and useful links. Bite size chunks of useful and practical information. Regular updates as new information and insights become available. The document has been authored by John Giles. John is a trusted independent professional legal adviser, who is a practising attorney. He is currently helping many people understand the practical impact of POPI on their organisations. He helps them to comply with POPI and implement effective privacy projects. He has also presented over 50 times on the topic to thousands of people. John is an information, communications and technology (ICT) lawyer. He has 13 years of practical experience applying his knowledge to organisations to help them grow and avoid legal problems, difficulties, and disputes. He is a member of the King IIITM IT Governance Sub-Committee.